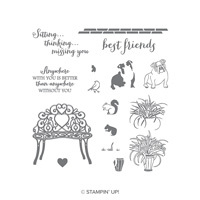 Sitting Pretty Photopolymer Bundle by Stampin' Up! Play around with the doggie, the squirrel, the flower pot, and the bench, and tell someone what they mean to you. 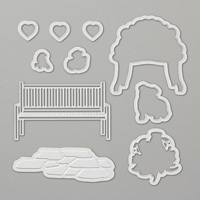 Create die-cut benches with light embossing texture and flower pots in record time with Framelits dies and the Big Shot. Note that the stone paver piece is an emboss-only piece (no cutting), and creates a cool light emboss effect.